Buying a new dining table? Or or you maybe planning a party? It is important to choose the right size when it comes to dining tables. If a dining table is too small, it will be uncomfortable for the guests. And if it is too big, it will feel naked. There are two main categories of dining tables: rectangular dining tables and round dining tables. In this page, you can determine sizes for rectangular dining tables. See also our size chart for round dining tables. Size Chart for round dining tables. 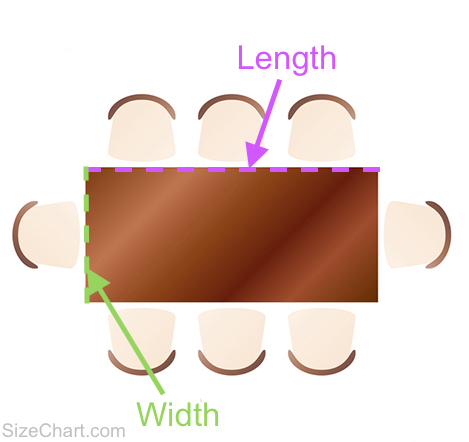 Table size = width x length. Room needed = width x length. Measurements in inches (see below for CM). * = Max. number of persons if both shorter sides of the table are in use. Size Chart for round dining tables. Table size = width x length. Room needed = width x length. Measurements in CM (see above for inches). Tips, Tricks or Questions about Dining Table Size? Tips, tricks or questions about Dining Table Sizing? Please post it below. Thanks!